Hooray I’ve finished cycle 3 of the Paclitaxel chemo. One more cycle (4 weeks) to go and I switch to the AC chemo for another 4 rounds. Everyone tells me that will knock me around more but I have my fingers in my ears. La la la. So far no nausea and other than two tooth fillings (one root canal) done without anaesthetic, I’ve been feeling pretty good. I have the odd Nanna nap, although now that I have a new bed I’m getting a much better night sleep. Boo to the latex one! Food tastes weird for a couple of nights after chemo. Everything I eat on chemo night puts me off it forever. I will never face Taco Bill or Parmas again. I’ve got the chemo routine down pat now. Each week I manage to get the canula put in my left arm so that I can draw pictures. The veins in my right one are much better and the nurses look at them longingly. I’m pushing my luck as far as I can. Here’s a picture of my routine. It’s enough to make you jealous isn’t it? You can’t see my Kindle but that’s my standby when I’m not chatting to the lovely people in the turban factory. I’m off to spend a week in a timeshare resort with the MOTH, given that I have next week ‘off’ chemo. It’s right next to a golf course so I can’t imagine what he will do with his time. As well as that, we are planning a trip OS next year and that is giving me a good goal to head towards. The MOTH and I plan to do an unguided trip to Europe (again) and meet up with a group of our good friends in Tuscany, Italy for a week. It’s such an exciting thought I can’t wait. Being the creative soul that I am, I’ve made an invention. 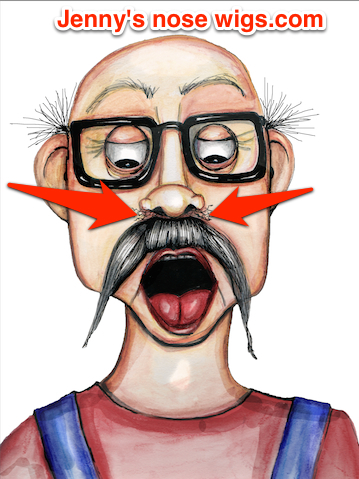 Having no nose hairs in my nostrils means that they run without warning at 1000kph. As well as this, I have no filter for bugs or pollens which I have always been sensitive to. So I’ve invented a nostril wig for chemo patients. I might cut up one of my wigs and create little mini ones. Do you think it will take off? On a final note… One of Colin’s work crew wrapped up a “Ferrari’ (in Christmas wrapping paper) for me because he said Colin would never buy me one. If you read my first couple of blog posts, written when I was first diagnosed with breast cancer that will make sense. Actually it’s a yellow Lamborghini but who’s complaining? I can highly recommend a villa in Tusccany that we stayed in. The family are very welcoming and still send us emails after 7 years. Perfect for a group. Recommended to our neighbours and their group said it was the best part of their trip. http://www.tripadvisor.com.au/VacationRentalReview-g663797-d3563702-or3-Villa_Antica_Sosta-Castelfiorentino_Tuscany.html#REVIEWS .